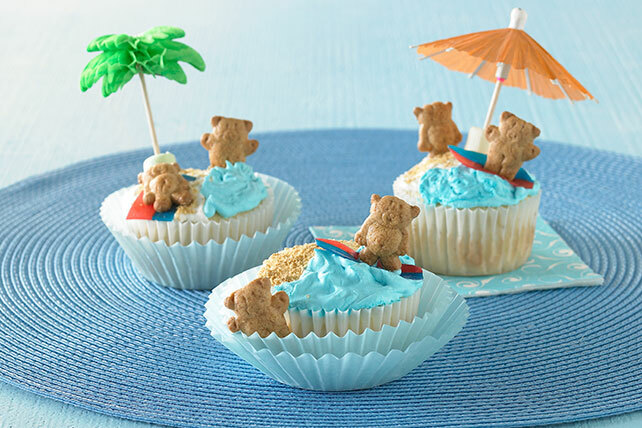 Nothing is as sweet as a day at the beach—except these adorable cupcakes that bring a sunny day at the shore straight to your child's party. Prepare cake batter and bake as directed on package for 24 cupcakes. Cool in pans 15 min. Remove from pans to wire racks; cool completely. Remove 1-1/4 cups COOL WHIP; set aside. Tint remaining COOL WHIP with food coloring. Spread top of each cupcake with some of each color COOL WHIP to resemble the ocean and its beach. Sprinkle 1 tsp. graham crumbs over white COOL WHIP on each cupcake for sand. Insert 1 small cocktail umbrella into beach area on each cupcake for the beach umbrella. Decorate cupcakes with remaining ingredients as shown in photo. Keep refrigerated. Spoon each color of COOL WHIP into separate resealable plastic bag; cut small corner off bottom of each bag. Use to squeeze COOL WHIP from bag to frost cupcakes. Flatten additional marshmallows with rolling pin to resemble beach towels. Or, cut wide, soft candy ribbon into pieces to resemble towels.